To create and spend a night in a campsite that is pitched between 50cm and 2.5m above ground level with the minimum of contact between your site and the ground beneath it. Your team will be challenged to live, eat and sleep in the SkyZone plus complete a series of additional challenges over the competition weekend. You are Network, Explorer, Senior Section or Ranger Unit looking for an active and adventurous challenge. 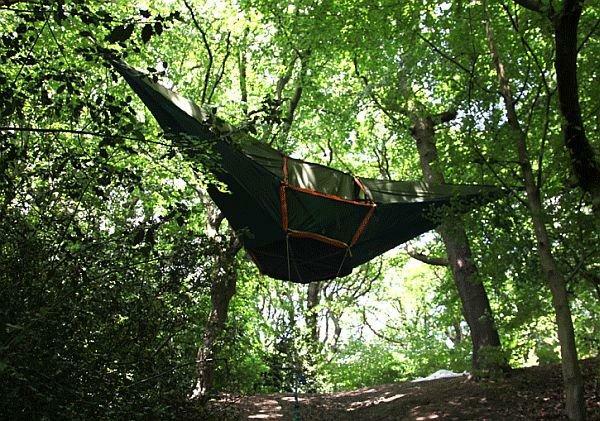 You enjoy surviving adventure camps and think that you camp in an eco-friendly manner wherever you pitch your tent. This weekend gives you the opportunity to see your Explorer and Network Units in action. You can leave them to their own initiative for the competition. For Explorer Units, you can be on the site or passport the team using your Nights Away permit. Camping for Leaders will be near the SkyControl Centre in the woodland where unit and leader tents can remain pitched for the weekend. Unit tents for Explorers or Network can be used by participants retiring from the competition at any stage during the weekend. Now, while you may take it easy for the weekend, we ask that you volunteer for some of the jobs that need to be done during the SkyCamp Challenge. These can include manning some of the competition bases on Saturday to marshalling around the site. There will be an opportunity to volunteer when you register on arrival. Leaders and Network members will have access to the SkyBar from 20:00 to 23:00 on Saturday evening. 18:00-20:30 Teams arrive at PACCAR Chalfont Heights, register, pitch tents, locate and stake their claim to a SkyCamp site. 10:00 Teams enter the Skyzone in the Chalfont Heights woodlands to begin building their Skycamp. Points will be awarded for innovation, eco-friendliness and effective use of space. Skycamps must be entirely within the Skyzone between 50cm and 2.5m above the ground. 15:00 Site and competition judging will commence. 17:00-19:30 Teams fully off the ground in the SkyZone and prepare a three course meal cooked over wood (Network) or using Gas (Explorers) within the Skyzone. Bonus points will be awarded for panache. 11:00-14:00 Lunch and Strike Camp. Points will be awarded for site cleanliness and eco-friendliness of the departure process. While we will have many safety features around the Chalfont site, we must remind participants that the Skyzone is between 50cm and 2.5m above the ground. Teams will be sleeping in the Skyzone on the Saturday evening. It is imperative that the sleeping arrangements minimise the risk of injury to the participants through falling from their Skyzone. Points will be deducted from teams deemed not to be taking suitable safety measures and unsafe teams will be asked to apply remedies to bring their sleeping arrangements into a safe state or retire to their tents. Explorer Leaders will be responsible for validating their unit’s safety. To enter the SkyCamp Challenge, contact the team on 01753 882640 or email skycamp@paccarscoutcamp.org to register your interest. They will send you a team application form to complete and return.